Benzodiazepines are a class of drugs that interfere with chemical activity in the nervous system and brain, serving to reduce communication between nerve cells. As a result, such medications may promote sleep, relieve anxiety, reduce restlessness, and relax muscles. Therapy with benzodiazepines improves sleep and reduces arousals from PLMS. This class of drugs may be less effective in eliminating movement and sensory abnormalities associated with RLS. However, in some severely affected patients, benzodiazepines significantly decrease the total number of abnormal leg movements during rest. Overall, long-term nightly benzodiazepine therapy has been shown to remain effective with a low risk of adverse side effects, tolerance, or abuse. Such therapy may be most helpful in those with mild or intermittent symptoms, particularly for young individuals. In those with severe symptoms, benzodiazepine therapy may be effective when used in combination with carbidopa/levodopa or dopamine agonists. The benzodiazepine clonazepam (Klonopin®) is often prescribed for the treatment of RLS. Other benzodiazepines that may be recommended as appropriate, suitable alternatives include temazepam (Restoril®), diazepam (Valium®), and triazolam (Halcion®). Benzodiazepines are taken by mouth prior to bedtime as needed. Average dosages for the treatment of RLS may range from 0.5 to 2.0-mg/day clonazepam, 7.5 to 30.0 mg/day temazepam, 5.0 to 15.0 mg/day diazepam, or 0.125 to 0.5 mg/day triazolam. Potential adverse effects associated with the use of benzodiazepines include morning drowsiness (somnolence), decreased sexual desire (libido), and a risk of falls during the night (particularly in elderly individuals). These medications may also result in obstructive sleep apnea or aggravate this condition if it is preexisting. It is also important to note that, depending upon dosage levels and other factors, benzodiazepines may result in dependency. However, there is usually a low risk for such benzodiazepine tolerance or dependency in individuals receiving long-term therapy. These medications should not be taken in combination with alcohol nor with other medications that have a depressant effect on the central nervous system. Benzodiazepines are rarely used as “party” or “good time” drugs. Recent studies of drug abuse liability have found that benzodiazepines are minor euphoriants: they are neither sought nor valued on the same level as cocaine, methaqualone, or even alcohol. Although they do have mild to moderate euphoric effects in recreational drug users, detoxified chronic alcoholics and, at very high dosages, detoxified sedative “addicts”, only a small proportion of patients entering drug abuse treatment programs cite benzodiazepine use as their primary drug problem. However, it is difficult to estimate the extent to which benzodiazepines are primary drugs of abuse, i.e. the extent of their ability to induce euphoria with psychic dependence and active drug-seeking behavior. This may be due in part to inconsistent or ambiguous reporting terminology and reliance on laboratory studies without comparisons with actual street use. In addition, it is unclear if patients admitted to emergency rooms for non-medical use of benzodiazepines are typical of all patients who abuse these drugs. 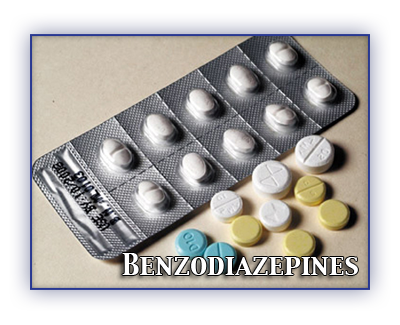 The benzodiazepines are among the most frequently prescribed of all drugs and have been used for their anxiolytic, anticonvulsant, and sedative/hypnotic properties. Since absorption rates, volumes of distribution, and elimination rates differ greatly among the benzodiazepine derivatives, each benzodiazepine has a unique plasma concentration curve. Although the time to peak plasma levels provides a rough guide, it is not equivalent to the time to clinical onset of effect. The importance of alpha and beta half-lives in the actions of benzodiazepines is discussed. The role of cytochrome P450 isozymes in the metabolism of benzodiazepines and in potential pharmacokinetic interactions between the benzodiazepines and other coadministered drugs is discussed. Buspirone, an anxiolytic with minimal sedative effects, undergoes extensive metabolism, with hydroxylation and dealkylation being the major pathways. Pharmacokinetic interactions of buspirone with other coadministered drugs seem to be minimal. Zopiclone and zolpidem are used primarily as hypnotics. Both are extensively metabolized; N-demethylation, N-oxidation, and decarboxylation of zopiclone occur, and zolpidem undergoes oxidation of methyl groups and hydroxylation of a position on the imidazolepyridine ring system. Zopiclone has a chiral center, and demonstrates stereoselective pharmacokinetics. Metabolic drug-drug interactions have been reported with zopiclone and erythromycin, trimipramine, and carbamazepine. Reports to date indicate minimal interactions of zolpidem with coadministered drugs; however, it has been reported to affect the Cmax and clearance of chlorpromazepine and to decrease metabolism of the antiviral agent ritonavin. Since CYP3A4 has been reported to play an important role in metabolism of zolpidem, possible interactions with drugs which are substrates and/or inhibitors of that CYP isozyme should be considered.